Know what? It’s ours too. The morning after Cod Wars, we gathered with about 400 others at the sun-bathed event grounds, and first perused the craft market setup by local artisans. There were jars of bakeapple jam, jewellery, clothing, photography, and sooo much gorgeous knitting. Oh my word – Newfoundlanders really know how to knit. At 10am, the pistols fired and the hike began (kidding - there were no pistols, just some really nice opening remarks from host Seamus O’Regan). 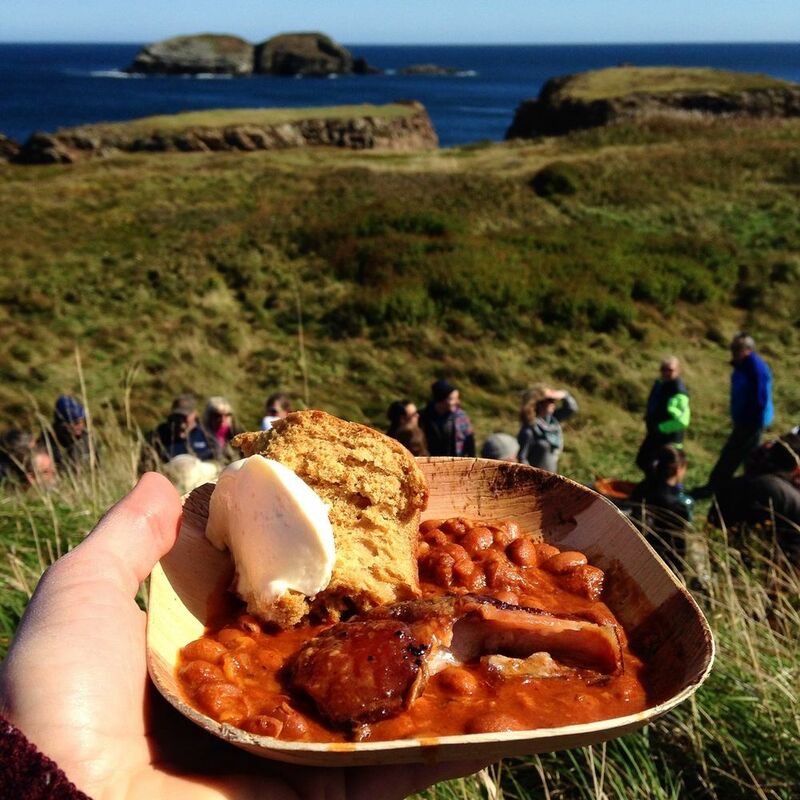 The festival brings in five chefs from “Away,” and each serve a course along the five kilometer route that winds along Elliston’s coastline. We opted to hop on the bus and head to the last of the stands, and work our way from end to beginning. We started with Chef Jessica Pelland, Executive Chef at Calgary’s upcoming Charbar, and Alberta’s first winner of CHOPPED Canada. She served perfectly-spiced kofta with pickled veg on homemade roti, which we ate standing next to the fish flake we’d admired in Elliston last year. Next, we walked up and around a hill, and watched as Chef Marc Lepine and co. carved up glistening slabs of grilled ribeye, which they served in a miso broth with turnip, carrots, barley, chanterelles. The highly-lauded Chef Lepine was visiting from Ottawa, where he’s chef and owner of Atelier. Of all his credentials, my favourite is “International Shellfish Champion,” which he won last year in Charlottetown, PEI. A stroll down the hill and a glass of rhubarb lemonade later, we arrived and got in line for Chef Anthony Walsh’s dish. He’s the Corporate Executive Chef for the Oliver and Bonacini group in Toronto, and former Executive Chef at the iconic Canadian restaurant Canoe. Further down the road was Chef Matty Matheson of Parts and Labour - he's a talented chef, Vice host, and a real eccentric (all you have to do is look at his Instagram feed and you’ll see what I mean). and Jim Payne, Fergus O’Byrne, and Sean McCann were playing music. On the root cellar. Matheson served up the meatiest of meaty baked beans (an entire pig went in there - Dana watched as he pulled a hoof from it - true story), grilled pig face (also a true story), and molasses bread, which he smeared with pork fat honey butter. It was like frosting on a cake and we couldn't get enough of it. Picture at the top of the post! Nearby, Dialog Wines had setup a wine garden, and we hung out there for a while, chatting with locals - including one we met in Trinity last year! Our last stop was Chef Dale MacKay of Ayden Kitchen and Bar in Saskatoon, the first Top Chef Canada champion. He’d brought along his restaurant Co-Chef, Nathan Guggenheimer, as well as his son Ayden, for whom the restaurant is named. I don’t think bearded dudes love being described as adorable, but as a team? These three were adorable. They’d brought some corn along from the prairies, and made a splendid cod and corn succotash dish. Despite just having eaten five meals, there was no question we’d be getting dessert. Why? Because the local ladies of Elliston had baked it themselves, and there is NOTHING better than local ladies’ home-baked goods. They had several long table covered with cakes, squares, and cookies, and they let us pick anything we wanted! Even two pieces! We ate our pieces of cake - including a piece of partridgeberry pudding with butter sauce, because that pork fat honey butter hadn't quite been enough - then joined dozens of others taking naps on the grass. After all, in about two hours The Feast was set to begin, and there was some serious digesting to be done. See what I mean? Best hike ever.